jay is a thief with the idea that “there is no team in I.” His father, Jafar, has been sure to pound that into his head since birth. However, even with the brain-washing Jafar distributes, Jay still finds his life a little disturbing and wanting of something more. When he is forced to leave the Isle of the lost and attend school in Auradon, Jay, at first, steals what he can and has a little too much energy to spare. Seeing this, the Fairy Godmother has Jay and Carlos join the sports team. The ‘teamwork’ concept is a little foreign, but with the help of a coach, Jay soon learns that there is more to life than me-me-me or I-I-I. With Jay now on the sports team, he needs a snack every now and then. 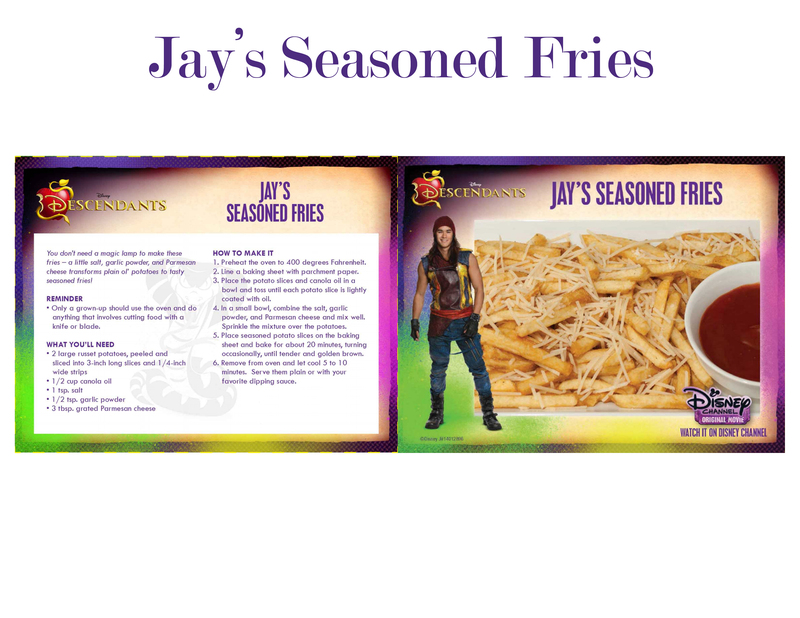 Jay’s preferred snack are Seasoned fries. You don’t need a magic lamp to make these fries – a little salt, garlic powder, and Parmesan cheese transforms plain ol’ potatoes to tasty seasoned fries! Grab the free recipe below by clicking print and saving it as a PDF or download the recipe card! Only a grown-up should use the oven and do anything that involves cutting food with a knife or blade. You can grab more free Disney Descendants printables from my blog page here: Disney Descendants printables. There are cupcake toppers, bookmarks, party supplies and more!